RB Casa Royale Sateen Bedding - Swatches may be available. Create a bold statement with this digital printed sateen with large brush strokes in blue hues. 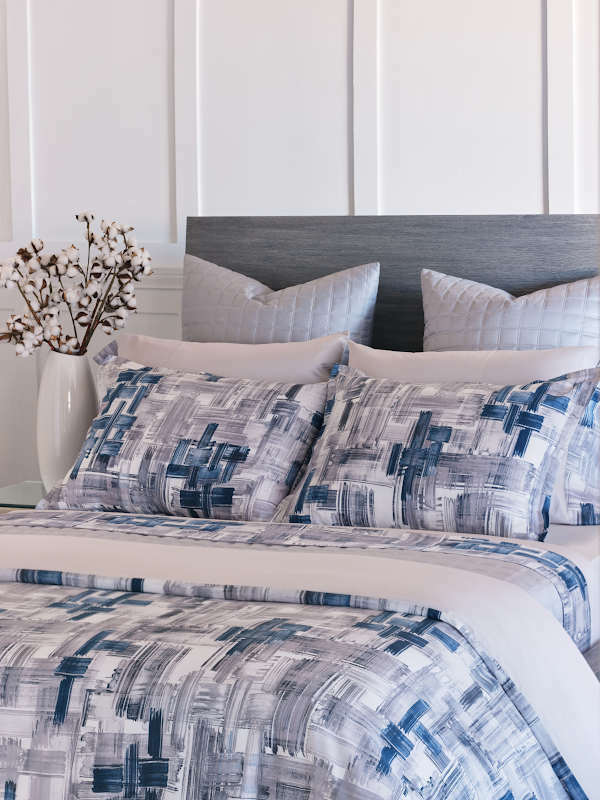 Flat Sheets - Solid sateen finished with 6" printed border applied on the edge. Shams - Allover printed sateen finished with simple hem. 1" miniflange. Central inner flap opening on the back. Pillow Cases - Solid sateen finished with 4" printed border applied on the opening. Inner Flap. Duvet Covers - Allover printed sateen front/back with hidden buttons closure. All over printed sateen front/back with hidden buttons closure. Solid sateen finished with 6" printed border applied on the edge. Sold as a pair. Solid sateen finished with 4" printed border applied on the opening. Inner Flap. Allover printed sateen finished with simple hem. 1" mini flange. Central inner flap opening on the back.